A sea of lava is a sad reminder of how destructive nature can be. To an imaginative mind like César Manrique’s, though, it’s a diamond in the rough. With creativity, he turned this hidden gem into a famous work of art – the Volcano House. 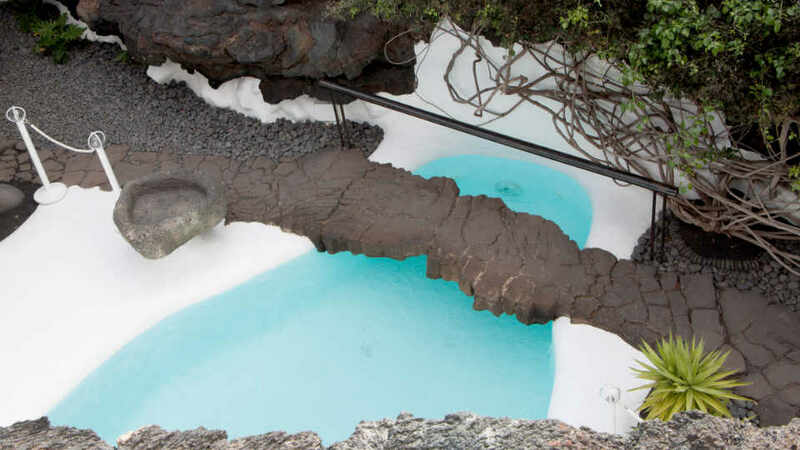 Today, it is also called Fundacion César Manrique, Tahíche’s most popular tourist spot. And, its doors are wide open to those who seek art, beauty, nature, and uniqueness. A native of Lanzarote, César Manrique went back to his roots from New York City in 1966. It was while he was walking around the sea of lava that covered much of Tahíche that he chanced upon the tip of a fig tree. Curious and puzzled, he took a closer look and learned that it grew from within a lava bubble. And, that’s when a fantastic idea hit him. Underneath what many people thought was a useless field of volcanic rocks are five bubbles. And, for an artist and architect in search of a new home, they are precisely what he needed. The bubbles were interconnected and, in 1968, the work and display space were finished. Manrique’s new abode, however, wasn’t only some unique structure. It was art in nature and nature in art, the very philosophy he dedicated his life to. 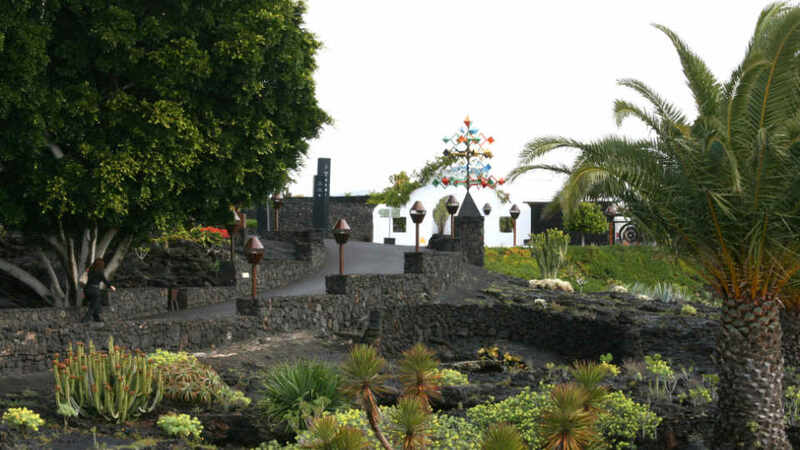 The abode is known by three names: Volcano House, Fundacion César Manrique, and Taro de Tahíche. Built on 3,000 m2 of hardened lava flow and with five lava caves, it was destined to be unlike any other. It wows every guest as soon as they arrive. And, by the time they reach the lava rooms, jaws are already on the floor. First impressions count, and Manrique sure did think so too. Visitors are welcomed by his two sculptures Juguetes del Viento (Wind Toys) and El Triunfador (The winner). The gates then open onto a small yard that is a prime example of ‘stylish’ planting. It has palm trees sticking out of the lava caves, not the usual way anyone would see these floras. The wall-climbing cactus and lush red bougainvillea also beautify even the walls. The two-story home turned museum has 11 sections. Guests will first walk into the main room called “Personal Collection.” This parlor is a giant bubble decked with Manrique’s private contemporary art collection. Some of the works are by Chirino, Equipo Crónica, Farreras, Guerrero, Gerardo Delgado, Sempere, and Zóbel. The outdoor pathway to the second room has a panoramic view of the tranquil lava expanse. It is also one of the areas where the roofless swimming pool can be seen. Before heading to the next area, take a moment to admire the sights first. “Spaces,” the second room, is all about the maestro’s love for nature. Exhibited are drawings and photos of his works that involve and revolve around it. To get to the next area, guests must cross a corridor of contemporary art from the Canaries and go past the main room. The third chamber, “Sketches,” is Manrique’s very own bedroom. It is unlike any other, though, as it has the scent and mark of a genuine artist. Amongst his artistic creations displayed are personal drawings, notes, mural sketches, and sculptures. Although not exactly a room, the basalt stairway is one of the most unusual parts of the house. It leads to five underground volcanic caves with names according to their themes. The first cave is the “Fountain Bubble.” It is what its name suggests, and the only one not named after a color. The four other bubbles are parlors named and furnished in different hues. The White Bubble has a palm tree in the center peeking to the outside world through the roof hole. The adjoining Red Bubble is similar but has a dead fig tree instead. This is the same fig three that Manrique noticed while walking on the lava field. From here, visitors can continue to the swimming pool which once had a roof, until it collapsed. The next cave is the Black Bubble which has four pillars. Then, the Yellow Bubble which leads to a painting exhibit hall called the “Manrique Collection.” At the end of the gallery is a huge window that gives the illusion that lava has flowed into the building. It also offers a fantastic view of the lava stretch that makes the space look longer than it is. It’s going to be hard to part with such a lovely and serene place. To stay a little longer, guests can either have a snack at the cafeteria or drop by the art shop for a souvenir. Stroll around the property again. Its magnificent architecture and landscape deserve one more look. 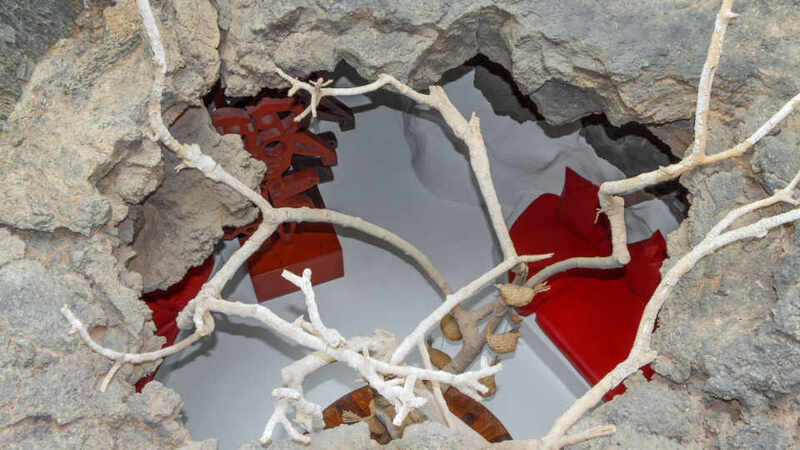 After a tour of the museum, visitors have greater respect for César Manrique and his works. There’s also a deeper understanding of the concept art in nature and nature in art. How about visiting his Palm Grove House in Haria next? That sounds like a great idea. 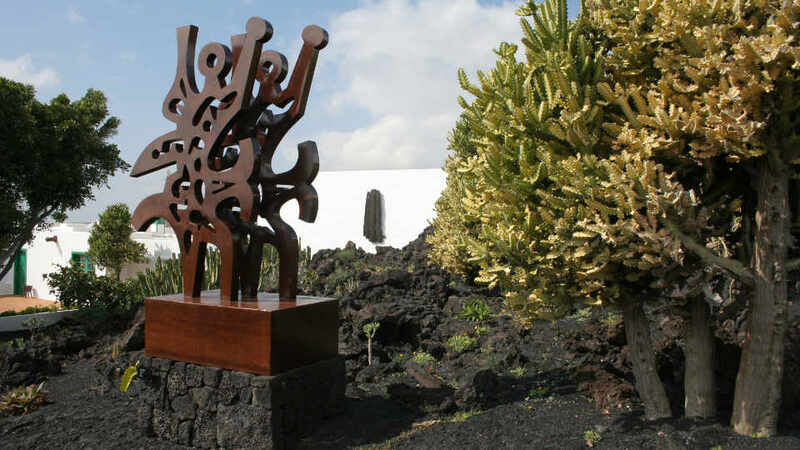 The doors of the César Manrique Foundation are open to visitors every day from 10:00 am to 6:00 pm. This includes holidays, except January 1. To buy tickets, head over to the on-site counter which closes at 5:30 pm. Those who will visit the House Museum in Hagia before going to Tahíche can buy from the counter too. The standard ticket price is €8, while children up to 12 years old and under can enter for only €1. The museum has a snack bar, but there are three other restaurants in the village if it doesn’t suffice. As Tahíche is but a hamlet, admittedly, its dining options aren’t as plentiful and diversified as the big towns in Lanzarote. However, what it lacks in numbers, it compensates with quality food. Families traveling with kids especially love La Malecita. The restaurant not only serve tasty plates, it also has amenities for the whole family. Enjoy their three meats, roasties, and Yorkshire pudding before hitting the games room. Parents relax over drinks in the beer garden while their kids play around for hours. Children play to their hearts’ content in the bouncy castles, playroom, and playground. From ping pong to homemade pies, La Malecita’s got it covered. Sweet delights never run short in Tahíche, all thanks to Levain and El Pastelito. Their pastries and bread are always heavenly, freshly made, and perfect with coffee. Levain is famous for their cakes, tarts, and doughnuts. For those who don’t have a sweet tooth, this bakery has delicious sandwiches. Do try their Serrano ham, cheese, and tomato sandwich. El Pastelito is also a crowd favorite for the same confections. In addition, they make unforgettable meringue, bread, and rolls too. From Lanzarote Airport in San Bartolomé, tourists must take bus lines 22 and 23 to Arrecife first. Both buses have one to two trips per hour on weekdays. They go as early as 7:00 am up until 22:40 pm. As for weekends and holidays, there are fewer trips, but both have at least one almost every hour from 7:10 am to 21:10 pm. Once in the capital Arrecife, there are plenty of bus options. Bus lines 07, 09, 10, 14, 26, 52, and 53 all stop at Tahíche. Some of them have trips all throughout the week, including holidays. The others though only go on weekdays and with fewer trips too. César Manrique created an abode that also became a haven for a profusion of other astounding art pieces. Within its walls and lava bubbles, he imagined and created. It was the birthplace of a lot of his impressive works dedicated to art in nature and nature in art. Also known as Taro de Tahíche, the dwelling wasn’t only of unbelievable architecture. Even the landscaping proves just how much effort and thinking the maestro poured into it. From a sea of lava dismissed as worthless, he brought into existence a sanctuary people still marvel at decades after it was built. The Fundacion César Manrique is more than an artist’s home and Lanzarote’s museum. It’s a witness to great artistry and a treasury of countless masterpieces. Lastly, it is proof that art and nature can co-exist and that there’s beauty even in disasters.